The Pilatus after a smooth landing at Oliktok Point. The AMF-3 is peeking out from behind those snow drifts! After making the decision to extend the campaign by a couple of days, the team was optimistic and ready to go this morning. We woke up to find that winds had dropped to around 15–20 mph, just as forecast. We set out for the AMF-3 early to get all of our equipment up and running, and get out to the runway for an 8:00 launch. Our initial plan was to fly the DataHawk first, test the conditions, and get some flights to evaluate the performance of the radar interference mitigation. 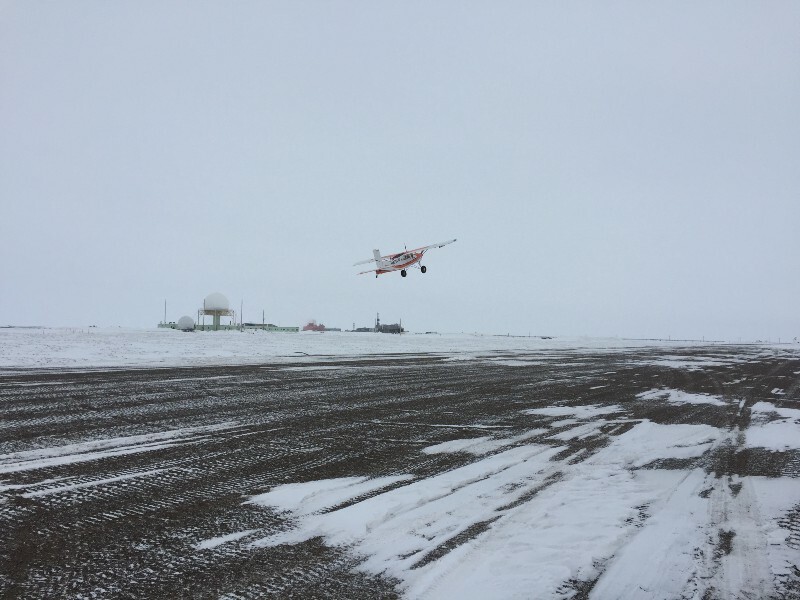 This proved more challenging than anticipated — when we got to the runway, we noticed an anomaly with our magnetometer. This component plays an important part in our guidance system, so launching with a questionable sensor is not really an option. Normally, we would have spent some time troubleshooting the problem to get the DataHawk in the air later in the day, but not today. Today was all about maximizing time spent flying, so we returned to the hangar and got the Pilatus ready for flight. I’m happy to say that we got some good flight time in with that airplane, and the two day extension is well worth it!! The Pilatus launching for one of four research flights today. We managed to get one flight in before Phillip had to leave for the airport. As mentioned previously, he has to get back to Colorado to keep up with his classwork, and departed as originally planned. It was good to know that he was able to experience at least one complete, successful flight, given that he travelled all the way up here to help manage the instrumentation for that plane. The first flight we completed went with the “light” payload, including our PTH (pressure, temperature and humidity) sensor on loan from NCAR’s Earth Observing Laboratory, as well as the Printed Optical Particle Spectrometer (POPS), on loan from the NOAA Earth System Research Laboratory’s Chemical Sciences Division. 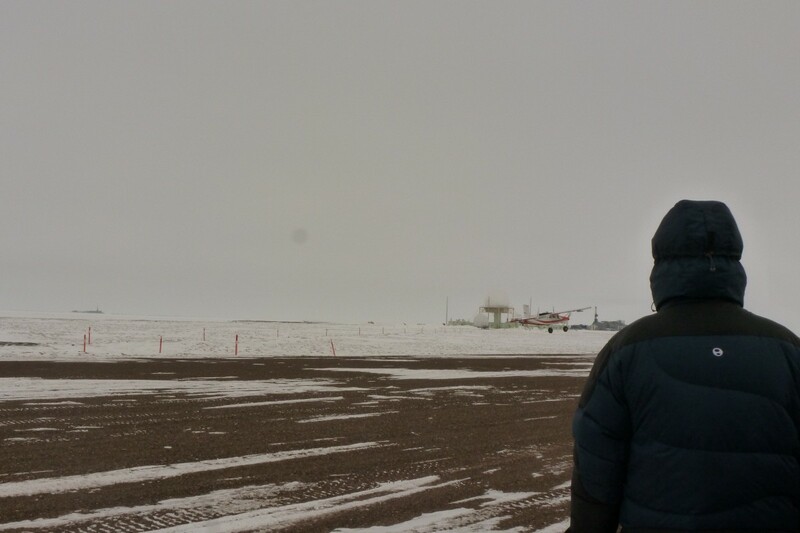 Ideally, with this set of instrumentation we would have completed a profile from the surface up to several hundred meters, but unfortunately due to low cloud cover at around 300 meters, we only flew up to 150 meters or so. The cloud cover is a problem because in these temperatures, there is a very high chance of ice accumulation on the aircraft, which can result in a crash due to redistribution of weight on the airframe or a loss of lift due to a reshaping of the wing surfaces. Gijs watching the Pilatus on final approach after a succesful research flight. Given that we had the low cloud cover, the rest of the day’s flights were focused on flying our heaviest payload, which includes the PTH sensor, POPS, and three SPN-1 shortwave broadband radiometers, which measure the amount of solar energy that is passing through the atmosphere. On the aircraft, we have sensors looking both up and down so we can see how much energy is coming down from the sun as well as how much is being reflected by the Earth’s surface. This second part is quite interesting right now, because the windy last two weeks that we’ve had has really redistributed much of the snow on the surface. 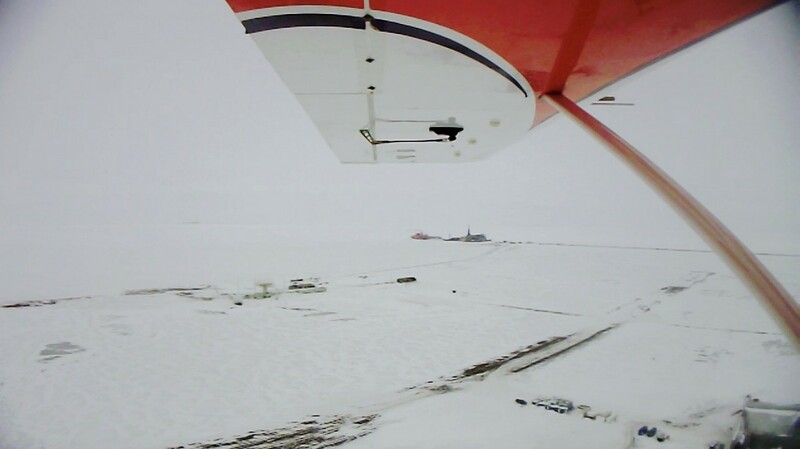 Because of this, the tundra’s shapes are very noticeable in the snow variability, as is the runway, the river, and all of the frozen ponds. Really excited to begin digging into the dataset! In total, we completed four flights with the Pilatus. Unfortunately, on the fourth flight, we had a minor maintenance issue come up. 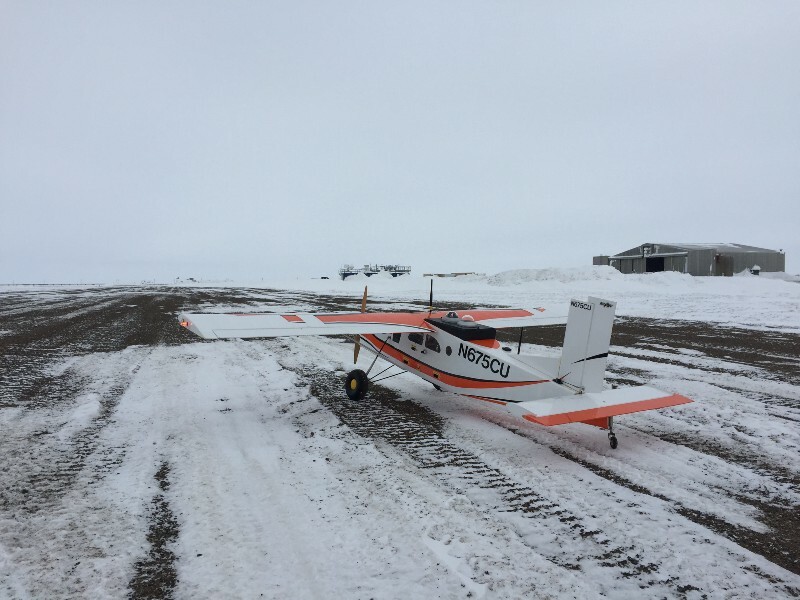 On landing, we had a minor issue with our tail wheel — nothing that can’t be fixed for more flights tomorrow, but definitely something that needed to be fixed before flying again. Therefore, we spent the rest of the day’s energy repairing the tail wheel and troubleshooting the DataHawk. The weather is forecast to be as good or better tomorrow, and we’re ready for a bunch more flights before packing up our equipment and getting ready for the journey home. Stay tuned for additional updates tomorrow! View from the wing… Looking towards Oliktok Point from the viewpoint of the Pilatus while in flight. The AMF and hangar are clearly visible in the lower right hand corner, while the USAF radar station is in the middle of the frame.